The college football season kicks off on Thursday and the Big Ten will be in the center of all of the action this weekend. Although there are only three Top 25 matchups in the first week of action, two of them will feature Big Ten teams. On Friday night, the Michigan State Spartans will host the Boise State Broncos in a nationally televised affair on ESPN. If the Big Ten wants to earn some respect to start the year, the Spartans will have to win this contest. While the storyline going in is that both teams are replacing record-setting quarterbacks, the truth is that the Broncos have to replace a lot more than just that. The Broncos are also going on the road while trying to replace their starting running back, four starting defensive linemen and top three linebackers. The Broncos have fared well in these types of early-season non-conference contests but that was with Kellen Moore under center, who finished his college career 50-3. Starting Joe Southwick – and an entirely new cast – is a whole other challenge. Speaking of challenges, the Michigan Wolverines will carry the flag on the college football odds into the highlight matchup of the week against the Alabama Crimson Tide on Saturday night. The Tide are the reigning national champs while the Wolverines are coming off a Sugar Bowl win. While it would be an unpleasant surprise if the Spartans lost, it would be a pleasant surprise if the Wolverines won. To beat an SEC defense like Alabama’s, teams usually need to have a pinpoint passing game and that will be put to the test. 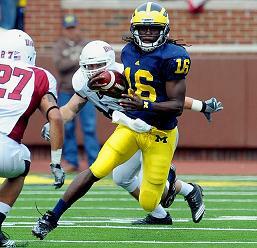 If the burden is solely on quarterback Denard Robinson’s shoulders, Big Ten won’t be pleasantly surprised. All eyes will also be on Penn State as they start the healing process this weekend when Ohio visits and also on the Ohio State Buckeyes, who began the Urban Meyer era. All trails to the BCS title will have to go through the SEC . Sorry Big 10 this isn’t your year ! Six degrees of separation ………… Michael Strahan is now Kelly Ripa’s co-host of a morning tv show . Stahan is now engaged to Eddie Murphy’s ex , Nicole Murphy , who also use to be a neighbor of Ripa . Sugarland is also a great country music band , unfortunately the name will be now associated with the comeback of Roger Clemens . Wasn’t there some po-dunk town in Texas , called S#it-town that he could have signed with ? Hit me with your best shot ……. Another tough loss for Boise State was the departure of Brent Pease their offensive coordinator. We’ll have to wait and see if the Broncos’ loss was the Gators gain. When is it the Big Ten’s year? And how many schools do they have on probation? I wish Strahan luck on early morning TV but can’t say that I’ll be watching. And what’s Clemens getting paid to play on that team? Any idea? Here’s hoping Pease will be able to get the orange and blue to move the ball both on the ground, and in the air, with some consistency.